Members of the Outreach Committee and guests following committee meetings at the 2019 Florida Bar Winter Conference. 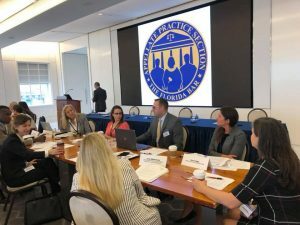 The Outreach Committee of The Florida Bar Appellate Practice Section is charged with making connections with courts, local and statewide organizations, and most importantly, people throughout the state to find and engage in mutually-beneficial opportunities. We’re an active and dynamic group of engaging personalities with diverse backgrounds that love to collaborate with others to benefit our Section’s members, our practice, our profession, and the communities in which we live. What do Outreach members do? The variety of projects in which Outreach is involved means there are always lots of opportunities for anyone looking for a service or networking opportunity, regardless of experience. A recent overarching focus has been inclusivity—looking for ways to eliminate or reduce barriers and improve the diversity of the Section. 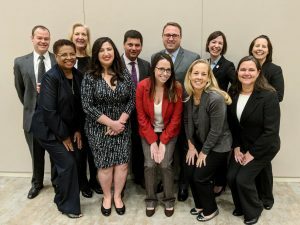 The initiative is not targeted solely to race and gender diversity, but also includes working with government attorneys, small firm and solo practitioners, and nonprofit attorneys. To that end, we’ve been working within our Section and with other organizations to create low- or no-cost legal programs. We’ve started to reach out to law schools and even some undergraduate and high schools to spread the word about the practice and reach students from different backgrounds. We’re looking for and developing programs to create pipelines for any person—regardless of financial status, race, gender, sexual orientation, religion, area of practice, you name it—with an interest in law and appeals to have improved opportunities to succeed and, hopefully, to participate in our Section’s activities. Thus, Outreach members who choose to do so get to travel to events throughout the State and represent the Appellate Practice Section. In addition to assisting with others’ events, we also attend all events run by our Section in order to promote who we are and what we do. On February 1st, the CLE Committee will be presenting “Hidden Essentials of Appellate Practice,” an all-day CLE at the Fourth District Court of Appeal. We will have Outreach members there to meet with attendees, talk with them about the opportunities in our Section, and look for opportunities to work with them. 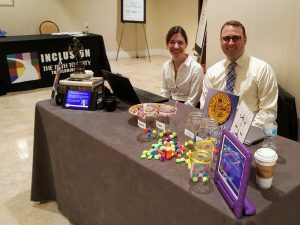 On March 16, 2019, Outreach will be attending the Seventh Annual Central Florida Diversity and Inclusion Picnic on behalf of the Section, hosting a table and meeting with members of the judiciary, the bar, paralegals, and law students. On March 20, 2019, the Appellate Practice Section (through Outreach) will be co-hosting an International Women’s Day Diversity & Inclusion Lunch & CLE Program with the Hillsborough Association for Women Lawyers and the George Edgecomb Bar Association. And we’re always pursuing random other projects tangentially related to our Committee’s goals. We recently held a logo design contest for the Section. We’re considering creating regional social events or orientations for new and potential Section members. And some of our members have been speaking with schools in their localities to put together appellate-focused programs in the upcoming semesters. Anyone is welcome to come check us out at our meetings, whether or not they are yet members of the Appellate Practice Section. We love to meet new people! There are three main meetings per year—at The Florida Bar Annual Convention, The Florida Bar Winter Conference, and one additional meeting in the fall that varies by year. The meetings are two hours long and typically fall on the Thursday morning of the major conferences. Our next meeting will be at The Florida Bar Annual Convention in Boca Raton on June 26-29, 2019. If you come, we’re happy to have you join us at our table and we can introduce you to people in some of our Section’s other committees as well. If you can’t make it to the meeting in person, you can still take part. We’ve broadcast our last several meetings via teleconference (accessible by internet orphone). Anyone is welcome to listen in. Contact me for more details about that. If you’ve read this far, perhaps you’re considering checking out what Outreach and the Appellate Practice Section have to offer. I suspect that there are many ways in which we can work together, but to start, we at Outreach would just be glad to meet you sometime soon. 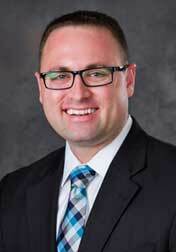 Jared is a Board-Certified Appellate Attorney with DPW Legal in Tampa Bay. He is on the Section’s Executive Council and chairs the Outreach Committee.